Do we always underprice tail risk? What in the world might underpricing mean when referring to a true tail risk? Adequacy of pricing assumes that someone actually can know the correct price. But imagine something that has a true likelihood of 5% in any one period. Now imagine 100 periods of randomly generated results. Then for each of three 100 period trials look at 20 year periods. The tables below show the frequency table for the 80 observation periods. if the “tail risks” are 1/20 events and you do not have any information other than observations of experience, then this is the sort of result you will get. The observed frequency will jump around. If that is the situation, how would anyone get the price “correct”? But suppose that you then set a price for this tail risk. Let’s just say you picked 15% because that is what your competitor is doing. And you have a very patient set of investors. They will judge you by 5 year results. So then we plot the 5 year results. And you see that my profits are quite a wild ride. Now in the insurance sector, what seems to happen is that when there are runs of good results people tend to cut rates to pick up market share. 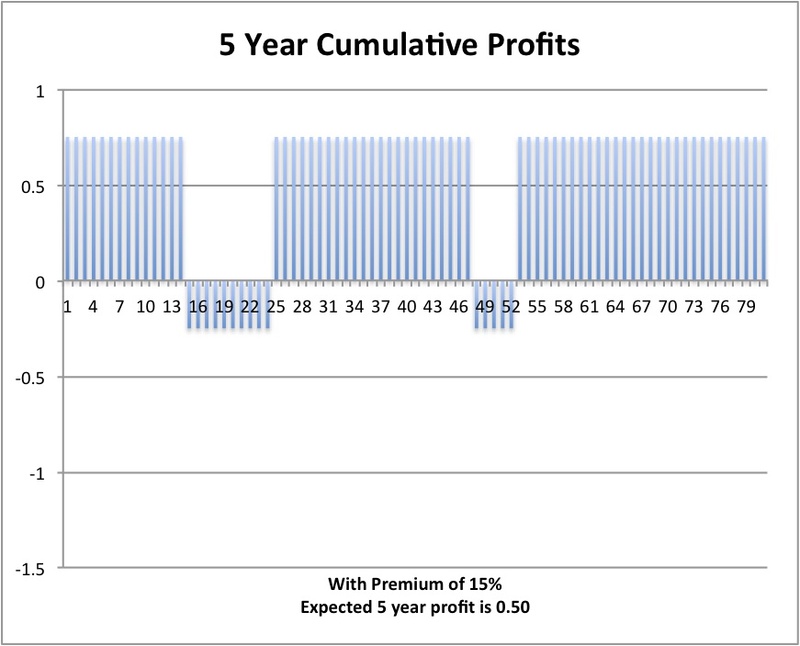 And when the profits run to losses, people tend to raise rates to make up for losses. So again we are stymied from knowing what is the correct rate since the market goes up and down with a lag to experience. Is the result a tendency to underprice? You be the judge. My favorite book of the Bible is Job. That could have been called the book of WHY. Everyone throughout the book assumes that there must be an answer and they try out those answers but none seems to fit. Finally, they get an answer, but it is not the sort of answer that they were looking for. The answer that they get is something like”you would never understand”. But the risk manager is always being asked why? Asked to explain the unexplainable. David Hackett Fisher advised historians to avoid WHY. To stick with who, what, when, where and how. A why question tends to become a metaphysical question. It is also an imprecise question, for the adverb ‘why’ is slippery and difficult to define. Sometimes it seeks a cause, sometimes a motive, sometimes a reason, sometimes a description, sometimes a process, sometimes a purpose, sometimes a justification. This list of definitions for the word why is useful to the risk manager however, because often there is no “why” under some definitions, but the other definitions can help to provide a path to an answer that is probably less than satisfactory but better than nothing. Nothing being the same as the answer “it is still a 1 in 100 event, we were just unlucky”. If you want the company’s executives to really embrace ERM, then the risk manager needs to have all of these definitions and as many of the answers as humanly possible on hand. The executive will need the risk manager to provide the words that they can use and feel comfortable lording it over their peers who do not have such a smart risk management department. They need the words than answer WHY. The famous quote about risk..
Vinar obviously had someone who did not have the above list of definitions of WHY on hand, he got the S— Happens answer from a math geek. That exercize ought to be a part of every year end wrap up from the risk department. Their recount of the who, what, when, where, how and WHY of the events of the year.